1. Preheat oven to 300 degrees. Spread walnuts in a baking sheet and lightly toast for about 15 min. Cool and set aside. 2. Heat 2 T olive oil and saute diced onions with a pinch of sea salt. Cook until golden, about 10 min. 3. Add sliced mushrooms to onions. Add a dash of pepper, tarragon, 2 tsp. balsamic vinegar and 2 tsp. tamari. Simmer on medium low for 5-10 min. 4. Transfer mushroom mixture and toasted walnuts to a food processer. Process into a smooth paste. Add more balsamic vinegar and tamari if needed. 5. Place in a serving bowl and chill for 2 hours or overnight. 6. Garnish with red sauerkraut and serve on mild crackers. 1. Combine lime juice, cilantro, Dijon mustard, olive oil, chili powder, salt and pepper in a food processor until well combined. 2. Place chicken breasts in a large zip lock bag. 3. Pour lime juice marinade over the chicken. Massage marinade over chicken so that chicken is well coated. 4. Refrigerate chicken for 2-6 hours. 5. Pour chicken and marinade into a baking dish. Cook at 375 degrees for 35 min. Alternatively, chicken can be grilled. 1. In a Dutch oven, saute onion, garlic, mushrooms and rosemary in olive oil until soft (about 10 min.). 2. Add kale and mirin and saute 4-5 min. or until kale is bright green and tender. 3. Add beans and saute an additional 2 min. until heated through. 4. Remove from heat and drizzle a little olive oil over the mixture. Season to taste with tamari and then serve. 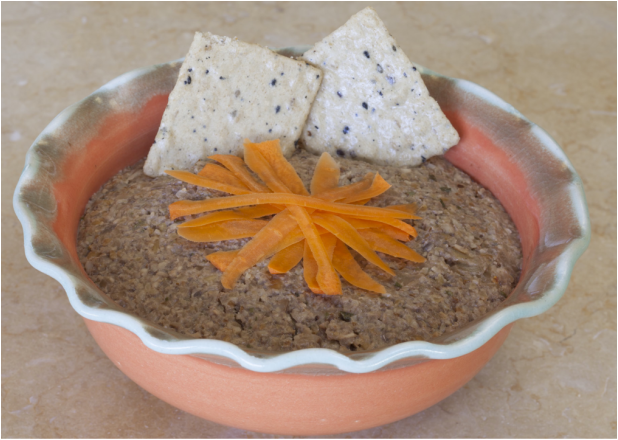 This pate is a delicious appetizer for a crowd or as an easy snack. The walnuts are an excellent source of omega 3 fatty acids and the mushrooms add some additional protein to the pate. It is a good source of energy boosting vitamins--B5 and B6. The pate also contains selenium, copper and manganese. It has no cholesterol and is low in sodium. If you use shiitake mushrooms, you'll get an added boost to your immune system. 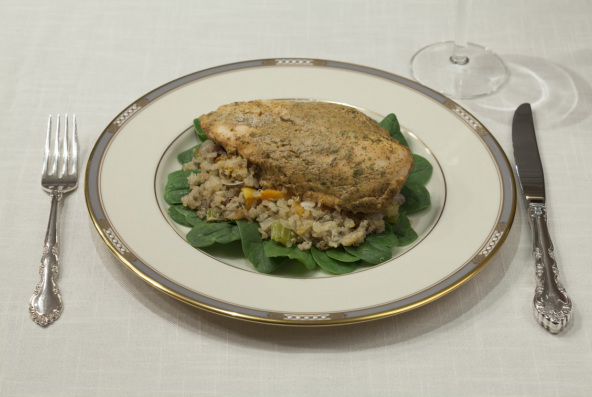 This chicken main course is simple to put together either for a casual dinner or a more formal meal. It is mildly anti-inflammatory. The cilantro supports our body's detoxification process. It is a great source of protein, niacin and selenium. It is also a good source of vitamin B6, phosphorus and magnesium. This may become your "go to" meal when feeding your family. 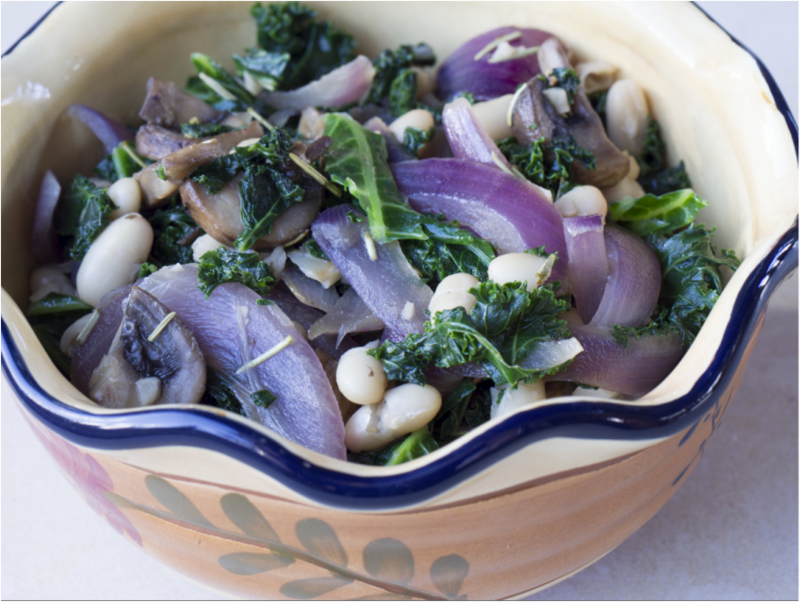 This vegetable combination is a healthy addition to round out your meal. Feel free to substitute other dark, leafy greens for the kale. The dark green kale is in season right now and chock full of wonderful nutrients. This dish is a very good source of vitamins A, C and K. It is also provides fiber, B vitamins, iron, magnesium, potassium, copper, manganese and selenium. So enjoy this powerhouse combination and your body will thank you.